Standard windows keyboard shortcuts don’t work. It’s not possible to copy/paste without using a special menu. Which means that my everyday work becomes very tedious than it has to be. Copy is even worse because you first have to put the editor into “mark” mode to make a selection before you do the ALT+SHIFT+space, then E, then C = even more time-consuming. I have been using Console 2 for a while as it provides decent support for the basic shortcuts and tabs (to avoid clutter the task bar with multiple windows). Console 2 has one major error in my environment: It freezes occationally when I use it for Ruby on Rails development (where I typically run 3 windows per application: one window for the webserver, one for the log-file, and one for commands). 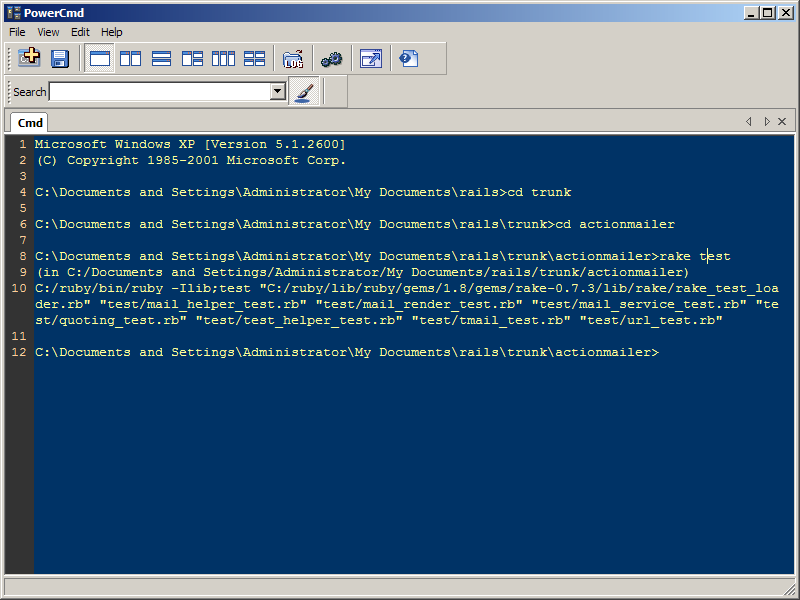 Microsoft PowerShell seems not to have tabs. At least it’s not mentioned either on the product homepage or in Wikipedia. “PowerCmd”. On the paper, it looks very promising: Multiple windows in tabs, usual keyboard shortcuts are there. But also more advanced features that I have been missing, like line numbers, search and result highlighting, word wrap on/off, and to choose between block selection and line selection. I’m sure that these features will help me speed up development further (if implemented properly), and look forward to try out the program. This entry was posted by Jesper Rønn-Jensen	on Monday, April 30th, 2007 at 11:48 (GMT-1)	and is filed under Productivity, Web Development. You can follow any responses to this entry through the RSS 2.0 feed. Both comments and pings are currently closed. I use Cygwin, and the console it comes with has the same problem. You don’t get much control over which mouse button selects, extends, or pastes, either. One good solution I’ve found to this is an extension to PuTTY that allows you to use it as a local Cygwin shell. This gives you access to your Cygwin shell (and by extension all of the stuff you can do in the Windows shell) but with the control over mouse and keyboard behavior that you get from PuTTY. However, it doesn’t have tabs. There is another utility to get Tabs in PuTTY called, unsurpsingly, PuttyTabs, but I have not tried it. After testing PowerCmd, i found out is has a problem with showing unittest output in Ruby . The small dots and failures don’t show up in PowerCmd. Here is the mail I wrote to PowerCmd support. I’ll post any answer I recieve as well. I’m evaluating PowerCmd to find a replacement for the traditional windows command. There is one fatal flaw that keeps me from choosing PowerCmd: I’m having problems when running unit tests (it does not show the output of the running tests). Is this a bug in PowerCmd? Let me just explain how to replicate this. I’m developing in Ruby on Rails. Running the unit tests for the open-source code Ruby on Rails show the problem. 3) As explained on http://dev.rubyonrails.org/ , check out source code “trunk”. When run from an normal command window, there are small dots that appear for every unit test that is run. When run from PowerCmd, the dots don’t show up. Even worse, if a test fails, the result is not shown. Please also let me know if you have planned any updates that can help me. Screenshots that show the difference between powercmd and another console. Notice that the dots don’t appear in PowerCmd but appear in a normal console window. Click on a screenshot to enlarge it. Reply from PowerCmd. I’m impressed to have an answer within minutes! Thanks a lot for you reporting the defect. Once I will be working on this defect in 3 hours, and will let you know the result as soon as possible. the release of version 1.3. Just got this reply, which means PowerCmd has fixed the bug for next version. I’m really impressed with this kind of customer support. I think I am lucky to have your detailed steps to reproduce the defect. It has been fixed now. This defect has been there since the first version of PowerCmd. I greatly appreciate your help. Just received an update from Paul at PowerCmd, that they released an update that fixes the problem. And it does. This is great news, so I’m upgrading my trial to a paid version. * change default setting for autocomplete away from automatic. 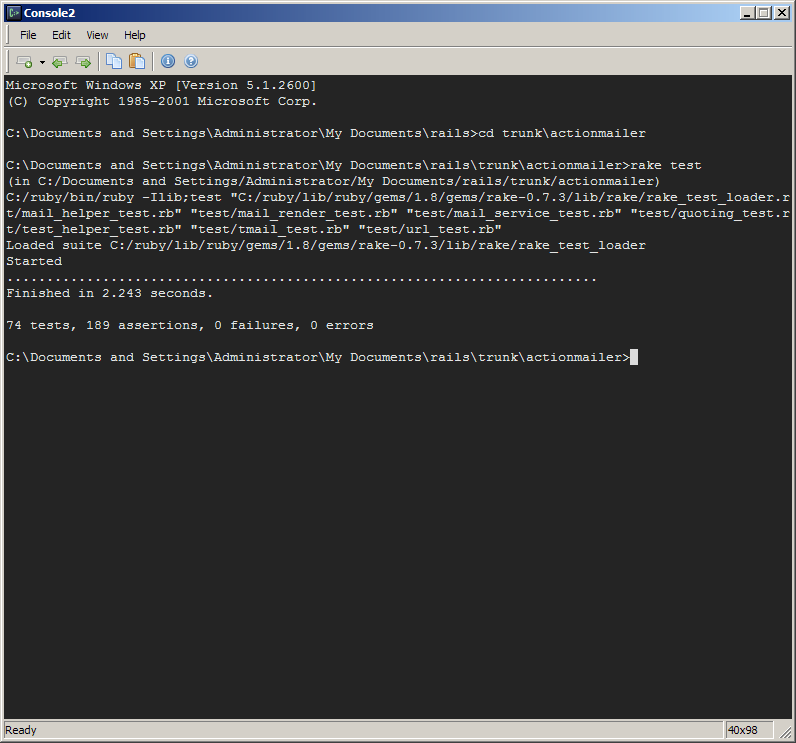 it can be annoying when executing a command has the same name as the start of a file/folder in current directory. An example of the latter is running the ruby command “rake” in directories that have a file called Rakefile (which is default). This way, autocomplete captures the ENTER key and autocompletes “rake” into “rakefile”. Very annoying. So I hope these two things can also change soon. Because “rakefile” is one of the file under “actionmailer”, if you press “ENTER”, I assume you are accepting the auto-completion. If you are going to finish the commands without accepting the autocompletion, you can press “ESC” and then “ENTER”, or if you have parameters for “rake”, you can simply press “SPACE” to stop autocompletion for “rake”. If “rake test” is you frequently used command, you can define it as a “tool” on quick launch bar, and use Ctrl+F1( or Ctrl+F2 …, depending on the position in quick launch bar) to access it quickly. I hope it could be helpful. Another thing that I discovered in PowerCmd: Ruby’s command-line interpreter irb can’t run. I described it in the PowerCmd support forum. Console2 just crapped out on me, and I’m a little frustrated. Think I’ll live with powercmd for awhile and see how it fits into my life. I guess the primary question is whether it supports cygwin bash consoles. Thanks so much for writing this blog! Did you ever have any luck with getting IRB (and therefore script/console) working? It was a deal-breaker for me and I’m still hunting for something that’s as usable as a Linux console on windows. I did not test it (since I am just coming to a Windows machine after 3 years of OS X and trying to find some stuff, like a decent console, tha’s how I came here), but there is also ‘mintty’ at http://code.google.com/p/mintty/ It uses the console code of PuTTY along with Win APIs in order to deliver a console replacement. I used to use Console2 a few years back and was very happy about it.